Last year I wrote a blog post about my experience using henna for the first time, it’s actually my most read post to date! This time I wanted to share my experience using Arctic Fox hair dye in Sunset Orange. I loved using henna because it’s natural but you can’t dye over it and given that I want to get some more highlights soon and do like to change the colour of my hair a lot I decided to try something a bit less permanent. I’d seen a few people mention Arctic Fox hair dye in a group on FB, it’s vegan & cruelty free plus comes in a huge range of colours. Arctic Fox also contains no drying alcohols, PPDs, or harsh chemicals. I went for Sunset Orange as I wanted it to be an orangey shade. You can see all the colours here. I bought mine off Amazon for £13.99 which isn’t all that cheap but it’s quite hard to find in the UK. The bottle isn’t all that big though and I could have done with a little bit more really as my hair is long and thick. So this was my hair before, it’s lighter at the bottom as I bleached it last year and that’s the part that has grown down. The top is much darker so I wasn’t expecting the colour to take that much to it but it actually did take pretty well. I wanted mine to be darker on top then lighter on the bottom, obviously if you want it all to be the same colour and brightness then you would need to pre-lighten all your hair but if you wanted something more subtle then it did make quite a difference to the darkest parts of my hair. 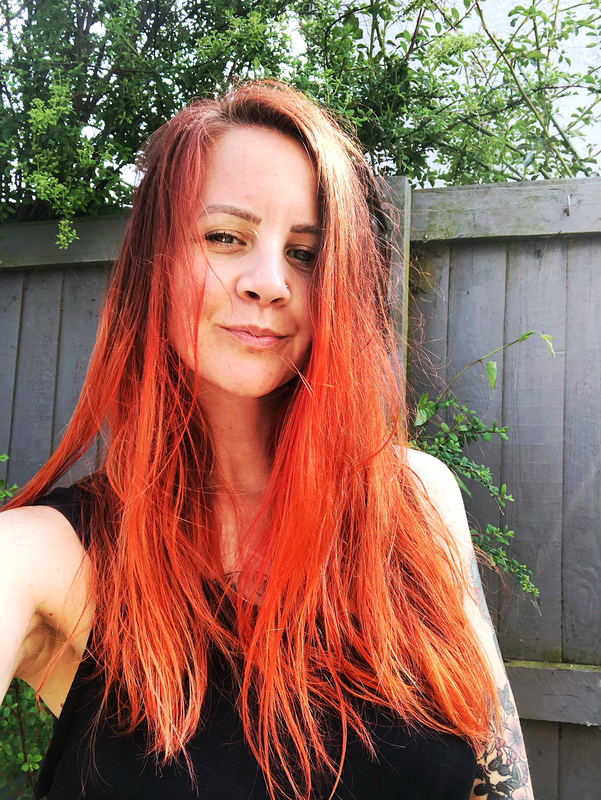 Here is the after, the colour is a lot more red than I was expecting, a lot of people mix the shades though and I think if I’d mixed it half and half with the yellow shade(Neon Moon or Cosmic Sunshine) then it would have been more the shade I was expecting. Or there is also Porange which is a much lighter orange. It’s fine though and I still like it. And actually once it had been washed a couple of times it faded down a lot. I wash my hair every day and it’s been about 10 days now since I dyed it so the colour has faded quite a lot but if you only washed your hair once a week then it would last a lot longer. I would definitely use Arctic Fox hair dye again.